Home > Car Wax, Sealants, & Coatings > Car Waxes and Paint Sealants (Synthetic) > Car Care Kits > Pinnacle Car Care Kits > Pinnacle RUPES LHR 21ES Natural Brilliance Kit FREE BONUS FREE SHIPPING! Pinnacle RUPES LHR 21ES Natural Brilliance Kit FREE BONUS FREE SHIPPING! For a Limited Time receive the Mike Phillips’ How to Use The RUPES Bigfoot Paint Polishing System Paperback Book FREE with your purchase of this kit! Retail Value $19.99. Create a flawless finish with Pinnacle and Rupes! The Pinnacle RUPES LHR 21ES Natural Brilliance Kit is the perfectionist’s choice for perfect paint! By combining the smooth and capable Italian-bred Rupes LHR 21ES Big Foot Random Orbital Polisher with Pinnacle’s advanced abrasive technology, you’re able to remove shine-hindering swirls, scratches and water spots in no time! This all-inclusive kit provides everything you need to polish your vehicle to a high-gloss, flawless finish, including the necessary Lake Country pads to use with each product. The Rupes LHR 21ES Big Foot Random Orbital Polisher ensures a perfect finish with its random orbital motion and exceptionally large throw. One of the biggest advantages of the LHR 21ES is that no swirls or holograms (also referred to as buffer trails) are instilled into the paint as you polish. A conventional rotary/circular polisher, while very effective at polishing paint to remove defects leaves swirls and holograms in the finish as a result of its direct drive, circular motion. Simply put, the Rupes LHR 21ES Big Foot Random Orbital Polisher leaves you with a perfect finish that’s free of swirls and holograms – all without the risk of burning through the paint The Rupes LHR 21ES is so easy to use that even a novice can have the polisher mastered after only one panel! 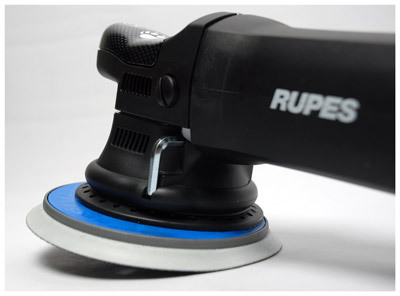 The Rupes LHR 21ES Big Foot Random Orbital Polisher has the largest stroke of any polisher on the market. This gives the LHR 21ES a huge advantage while working on large panels because it enables you to polish a significantly larger area, reducing your overall time and increasing profits if detailing is your profession. Like a fine Italian sports car, the Rupes LHR 21ES features remarkable engineering and exquisite craftsmanship; the ergonomics along with fit and finish on the LHR 21ES Big Foot Random Orbital Polisher are superb. The soft-start system guarantees an acceleration ramp to prevent accidental dispersion of your compound and polish while the electronic feedback control maintains constant speed in all applications. The energy-efficient 500 watt motor and massive, 21 millimeter stroke makes the Rupes LHR 21ES capable of removing up to 1500 grit sanding marks! Pinnacle Advanced Swirl Remover brings “user-friendly” to a whole new level! Diminishing abrasives and water-based lubricants blend away imperfections gradually, leaving a smooth paint surface. This tempered approach to polishing eliminates imperfections while being extremely gentle on the paint. Pinnacle’s diminishing abrasives are tempered to break down slowly and evenly under the motion of the oscillating pad. A dual action polisher provides just the right motion and friction to maximize the performance and working time of these abrasives. This approach softens the abrasives’ impact on the paint, which ultimately preserves more of the paint. If you have a newer vehicle or meticulously maintained paint, Pinnacle Advanced Swirl Remover is for you. Pinnacle Advanced Finishing Polish gives your vehicle’s paint maximum impact with a clear, reflective gloss and flawless appearance. This is more than a finishing polish; it’s the final word on shiny, smooth paint. With micro fine diminishing abrasives, Pinnacle Advanced Finishing Polish burnishes paint to a crystal clear gloss that looks and feels mirror-smooth. This is our most user-friendly, clearest-finishing final polish ever! Pinnacle Liquid Souverän Wax is the only liquid carnauba wax to come close to the sizzling shine of Pinnacle Souverän Carnauba Paste Wax. With an amazing blend of carnauba and liquid crystalline polymers, Pinnacle Liquid Souverän Wax achieves the deep, wet gloss of a paste wax in a long-lasting, easy-to-apply, liquid formula. The polymers are added to enhance the brilliant shine, the protection, and the durability of Liquid Souverän. Natural carnauba wax gives Crystal Mist Carnauba Detail Spray its distinctive, wet-looking shine. Carnauba, combined with crystalline polymers, creates sharp reflections and silky paint. This state-of-the-art carnauba-polymer matrix also enables Crystal Mist to bond to the existing wax for an instant but long-lasting gloss. On top of Liquid Souveran™ Wax, Crystal Mist reactivates the existing wax so you’re not just seeing a surface gloss – you’re seeing the depth and dimension of multiple layers of carnauba. This high absorption foam formula is intended for the application of waxes, micro-fine polishes and sealants. This pad has very light cutting power so it’s perfect for pre-wax cleaners. A total retail value of $632.90. You save $132.91!